Beaducation: The Blog: What makes the Bench Top Drill Press so cool? 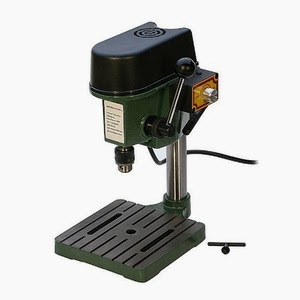 What makes the Bench Top Drill Press so cool? Large tools may not immediately excite folks the way a new Swarovski rivoli or a brand new sterling silver blank might. Once you start working with our new Bench Top Drill Press, you just may have to contain your goosebumps. What makes this tool so special? Let us count the ways! Probably most exciting is that it is powerful enough for you to drill through any gauge metal -- or wood, plastic or countless other materials you might want to drill. There are no limitations! That means you can drill through already dapped blanks or even folded flowers. You can even get into surfaces that would be off-limits with your hole punch pliers or screw-down hole punch. For instance, if you are working with sheet metal and you want to drill a hole five inches into the center of the sheet, this tool has you covered. You can make a hole just about anywhere! If you find yourself making many of the same designs, or your customers asking for multiple pendants, you know how tedious production work can be. The Bench Top Drill Press makes it a breeze! Stack your blanks up and let the motor of the drill press do the work. Your arms can be as small as Victoria Beckham's and you'll still get the job done with one pull of the lever. Not only can you punch a hole anywhere and punch a hole in thick metal, you can punch up to a 6.5mm diameter. That's a mighty big hole! Use your own drill bits from home or check out one our our bit sets. Don't forget one critical step every time you use this tool: be sure to wear your safety glasses! Our Instagram followers love this video demonstrating the drill press. 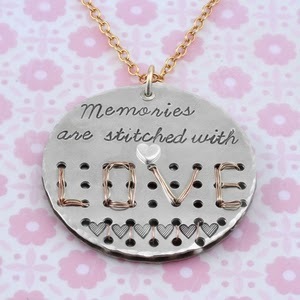 See how quickly we made all the holes in the pendant pictured above. Follow us on Instagram if you would like to see us test out other new products even before they reach the site!